It promises to get you thinking through your heart, mind and eyes and is divided into ‘Innovate’, ‘Make’ and ‘Play’. 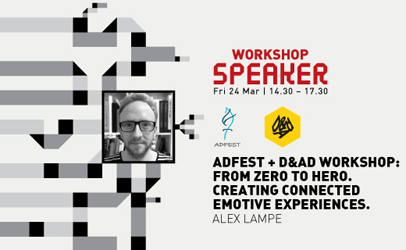 The space at this workshop is limited to only 30 participants so book now via Workshop@ADFEST.com. NOTE: Each participant must bring a laptop (Mac only) and download a demo of sketch at www.sketchapp.com for the workshop.